When you picture a brick fireplace, one likes to envision a roaring fire, a cozy hearth, stockings awaiting St. Nicholas on Christmas Eve. "That fireplace looks like poop." Well, that was just a 3 year old's opinion. Having not had the pleasure to experience the home styling circus that was the 80's, you can't really blame him for his comment. The fireplace itself is not bad at all. With a little vision, and a few supplies... it can time travel to the present day! Supplies: White paint, water, bucket, paintbrush, rags, baby wipes(best for fixing an oops), painter's tape(if you're messy), sponge, paint stick, cold beer(optional). Step 1 - Dilute paint with water. 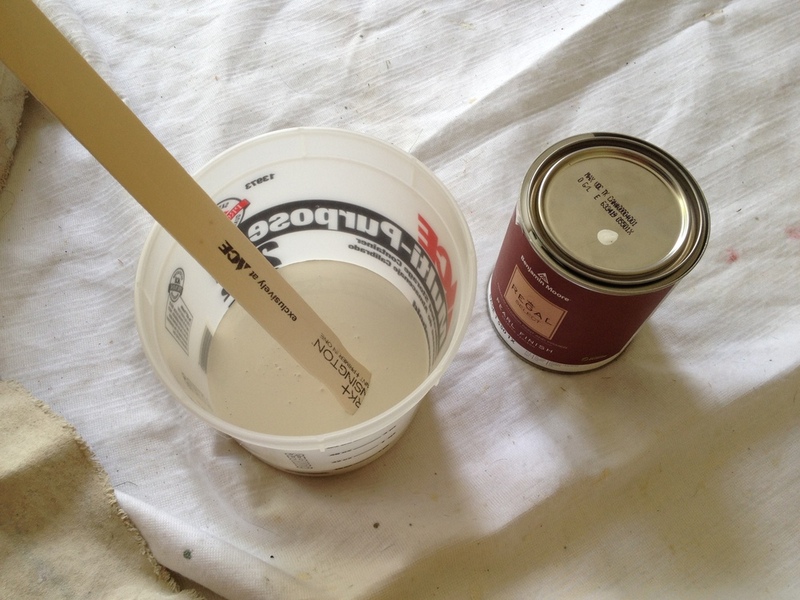 I used Benjamin Moore's White Dove which was our enamel color. I used a 2/3 paint, 1/3 water mixture. This can be adjusted depending on what kind of coverage you would like. All brick is different and will absorb much of the paint. 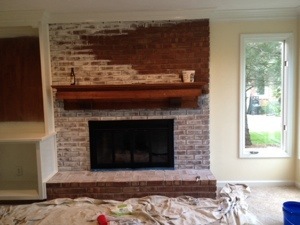 Please test a portion of the brick before you go crazy painting! You can always add more coats of the paint solution, but you can't go back. Step 2 - Brush the white wash solution on the clean brick. Since the solution will absorb quickly, I worked with about a 4-6 brick section at a time. Brush over the mortar in each section first, then lightly paint over each brick. Step 3 - "Wash" the brick. Use a damp paint rag or old T-shirt to wash over the bricks until you reach the white wash look you desire. Step 4 - Repeat Steps 2 & 3 until you are done. You may choose to do additional coats. Use more water or less solution to achieve a more "rustic" look. Or apply heavier solution sporadically in sections to achieve a more weathered appearance. You can color-wash too! It doesn't have to be a white wash. Grey looks amazing, light green tones, you name it! Just be cognizant of your brick tone when choosing a color-wash.